Heat oven to 375°F. Spray 24 miniature muffin cups with cooking spray. Brush mushrooms or wipe clean with damp cloth. Finely chop. In 6-inch skillet, stir mushrooms, butter and garlic. Cook and stir over medium heat 5 to 6 minutes or until butter is absorbed and mushrooms are tender. Stir in onions and mustard. If using crescent rolls: Unroll dough; separate into 4 rectangles. Firmly press perforations to seal. If using dough sheet: Unroll dough; cut into 4 rectangles. Cut each rectangle in half lengthwise; make 2 crosswise cuts to form 6 squares of dough from each rectangle. Press 1 square of dough into each muffin cup, letting corners stand above top of each cup. Spoon about 1 tablespoon mushroom mixture into each cup. Bake 10 to 12 minutes or until light golden brown. Meanwhile, cut Brie into 24 pieces. Remove cups from oven. 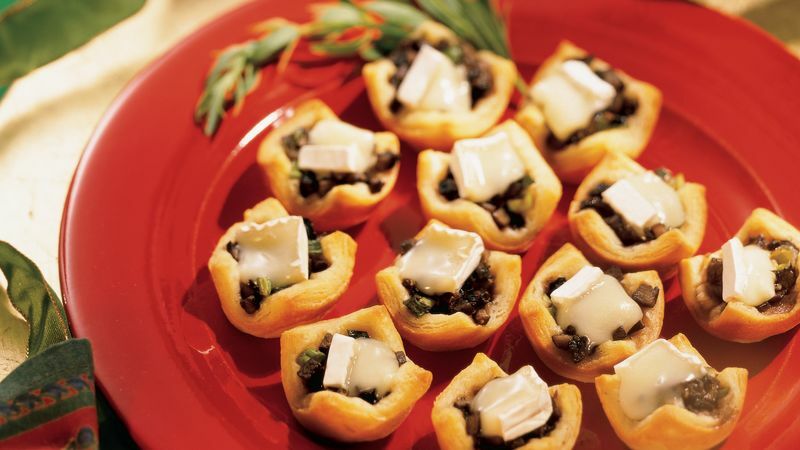 Place 1 piece of Brie over mushroom mixture in each cup. Bake 2 to 4 minutes longer or until cups are golden brown and cheese is softened. Cool 5 minutes; remove from muffin cups. Cool slightly before serving.